Shrimp, chicken, red pepper and zucchini are marinated in a mustard, soy sauce and apple juice mixture, grilled on skewers and served with couscous. Mix shrimp, chicken, peppers and zucchini in large bowl. Combine mustard, apple juice, soy sauce and garlic in small bowl. Remove 1/3 cup of the mustard mixture; cover and refrigerate for later use. Pour remaining mustard mixture over chicken mixture. Cover. Refrigerate at least 2 hours to marinate. Preheat grill to medium-high heat. 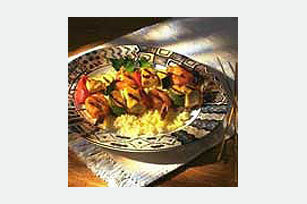 Thread shrimp, chicken, pepper and zucchini alternately onto 12 (10-inch) skewers. Grill 8 to 10 min. or until shrimp and chicken are cooked through, brushing with marinade and turning occasionally. Discard any remaining marinade. Meanwhile, heat the reserved 1/3 cup mustard mixture in saucepan on medium heat until heated through. Arrange skewers on serving platter over couscous; drizzle with mustard mixture.